As explained in chapter 1 and 2 above, the Portal uses a set of controlled vocabularies to link together archival holdings that share a creator, or are otherwise related by subject, geography, individuals or corporate bodies. Let’s look at an example to see how you can use these links to quickly find other descriptions that are related to a given archival holding. 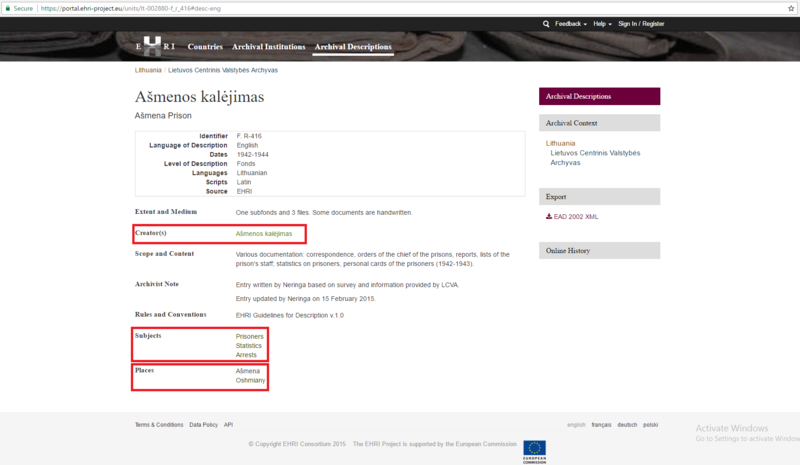 In the screenshot below you can see the description of the collection "Ašmenos kalėjimas" (or “Ašmena Prison” in English) held by the Lithuanian Central State Archives. The creator of this collection was "Ašmenos kalėjimas", an organisation described in more detail in the EHRI vocabulary of corporate bodies. The thematic subjects of its content include "Prisoners", "Statistics" and "Arrests", terms taken from the EHRI thesaurus of subject terms. It is related to the Oshimanyy Ghetto, which is a place name taken from the EHRI vocabulary of Ghettos. As you can see the collection is also related to another place, namely Ašmena itself. However, none of the EHRI place vocabularies include this term - and the method described below to locate related descriptions does not work for this term. 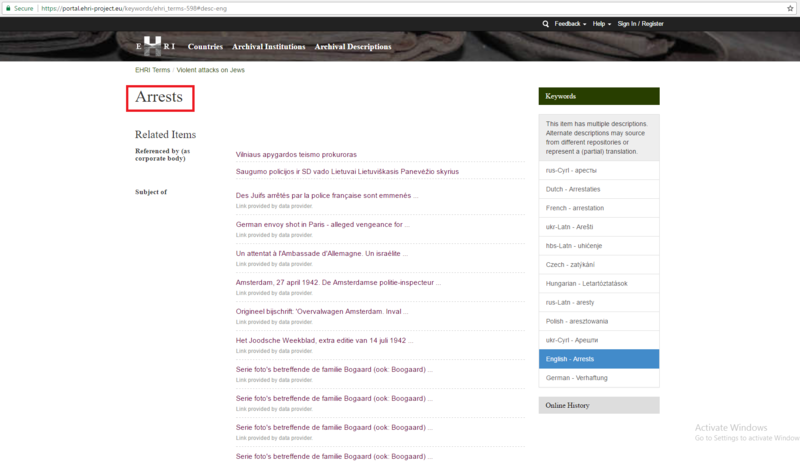 You can easily check whether a given term is taken from an EHRI vocabulary: if the terms gets underlined when you hover your mouse over it and is clickable, it is taken from an EHRI vocabulary, otherwise it is not. As you can see this description provides you with more useful information about this organisation - however, what particularly interests us here is the list of “Related Items” that is displayed toward the bottom of the screen. 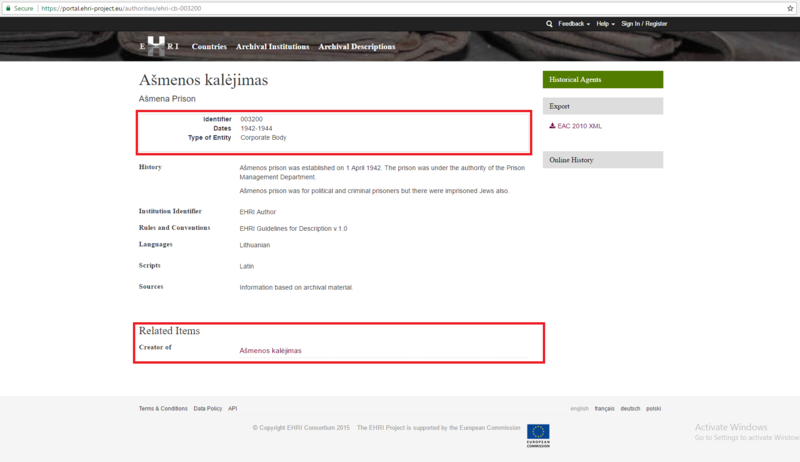 As you can see in this case the only related item is the description of the collection “Ašmenos kalėjimas” itself - i.e. the archival description from where we started. However, clicks on other terms lead to better results. For instance, if you were to click on the "Oshmiany" place term, you would find that the Portal hosts another archival descriptions that relates to this ghetto: namely the "Atrinkti duomenys iš Flossenburgo koncentracijos stovyklos memorialo" (or Selected Records from the Flossenburg Concentration Camp Memorial), held by the Vilna Gaon State Jewish Museum in Vilnius. Or, a click on the subject term "Arrests" will you lead you to a long list of other archival descriptions that share this term. While thus using linkages via EHRI vocabularies can in many cases be very useful, you should proceed with due caution. As explained in Chapter 2, currently only a small minority of the archival descriptions available in the Portal have been linked to vocabulary terms. Therefore, you should never assume that you have retrieved all relevant descriptions when you click on such a term. For instance, a simple keyword search for "Arrests" will retrieve many more archival descriptions that are relevant to this theme than can be accessed via the method outlined above.